This week in jet card reviews, we’ll be moving a little farther from the American continent and head on over to Europe, where our next company is based. GlobeAir® is an Austria-based private jet operator which prides itself on being the first mover in the European air taxi industry, and one of the fastest-growing operators within the continent. Founded in 2007, GlobeAir’s areas of service are mainly Europe, the United Kingdom, and North Africa, and it currently holds the most number of Citation Mustang jets in its fleet. With the 2008 financial crash, then, more European companies began to seek cost-cutting measures for some aspects of their process—particularly in aviation. And it’s this sweet spot where GlobeAir flourishes: with an extensive fleet of very light jets, they can both cater to this niche and cater to it well, as they have the advantage of guaranteed availability. Type offered. Jet cards usually come in two kinds: aircraft-dependent and deposit-dependent. Some providers offer both. That said, this aspect is something you might want to look into if you’re more concerned about the aircraft you’ll be flying in or just the amount you’ll need to pay for a certain number of flight hours. Price inclusions. It’s hard to make comparisons without talking about how much membership costs. More than knowing the price, however, is what the price includes—whether it covers necessary expenses or if it contains any unneeded inclusions. This is especially crucial if you’re flying on a budget. Services included. Finally, when purchasing a jet card, you want to make sure you’re getting a bang for your buck, especially when it comes to the services and amenities. Here, we detail what each program includes so you can see if they’re up to par with your traveling style. That said, it keeps a fixed pricing scheme from its bases, starting from around ≈$1,737.00 for roundtrip and≈$3,358.00 for one-way. Fortunately, GlobeAir’s jet card program does not have a membership fee or annual dues as others may contain. The jet card operates by way of add-ons: services such as catering, de-icing, as well as schemes for cancellations and reservations can be upgraded for a price. In a sense, the program is flexible enough for you to customize your services whenever you please. Guaranteed availability. One of the biggest challenges that services with very light jets face is limited availability, as most fleets only include 2-3 of them. As GlobeAir focuses on this category, however, this won’t be an issue—guaranteed availability, in this case, is indeed guaranteed. Can utilize more than one aircraft. As long as there aren’t any reservations during your schedule, you can make use of more than one plane. Just take note of the availability. Non-expirable funds. Haven’t used your card in a while? No problem. While you can’t refund on the jet card program, you don’t have to worry about them expiring. 24/7 customer service. If in case you have any issues with your flight, don’t despair—GlobeAir’s customer service is open 24/7 and will help you with any problems you might face. With its pricing and approach, it’s no wonder why GlobeAir continues to enjoy—and rightfully so—continuous growth and patronage throughout the years in Europe. But of course, like all other jet card programs, it’s best and cheapest when you utilize it within its area of service. Also, if you don’t travel with too many people regularly. With more jet card programs on the rise, we’ve taken it upon ourselves to look at each option as they come. After all, we believe the best choices are the most well-informed ones. That said, head on to our website and sign up with us now for more information. 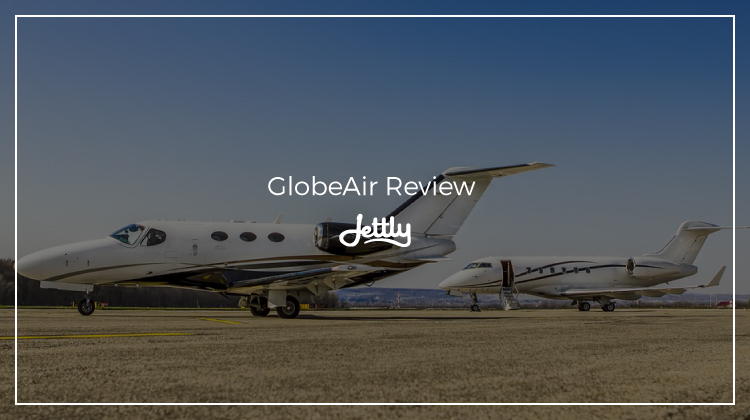 Disclaimer: Jettly is in no way affiliated with GlobeAir. GlobeAir is a registered trademark of GlobeAir AG.